1989-90 proved to be a banner year for Sigma Nus in head coaching positions in professional sports. 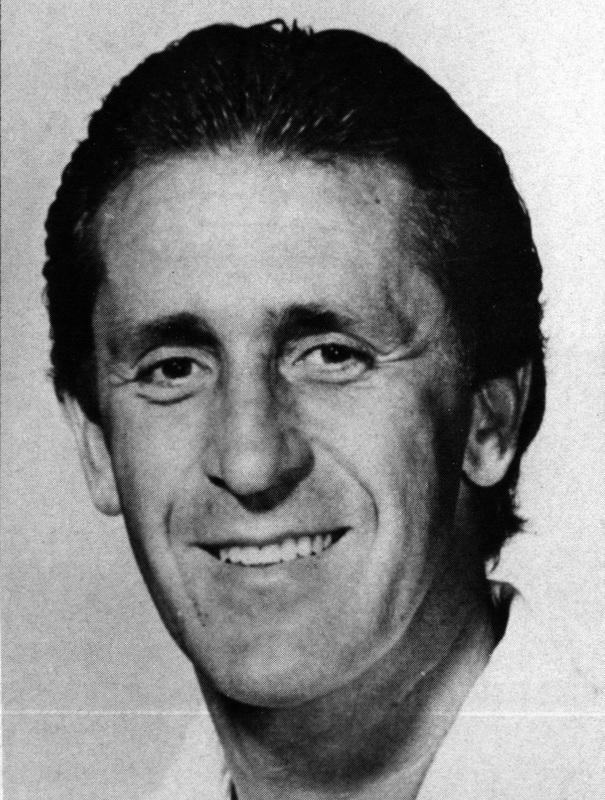 The National Football League Coach of the Year Award went to second-year Green Bay Packer coach, Lindy Infante (Florida), while Pat Riley (Kentucky), the head coach of the Los Angeles Lakers, captured the National Basketball Association Coach of the Year Award. Their achievements exemplify the leadership for which Sigma Nu is constantly striving; each man has reached the pinnacle of success in his respective sport — and in the same year! An encouraging trend among national fraternities generally is the steady increase in the number of new chapters and members. About 65,000 young men took the vows of a fraternity initiate during 1964-65, and of these 2,511 we claimed as Brothers in Sigma Nu. The year brought the total all-time membership, living and dead, of national college fraternities to more than 2,225,000. A group of undergraduates, known as the Zeta Delta Fraternity, at the University of Idaho, has been granted a charter empowering it to organize a Chapter of the Sigma Nu Fraternity. The favorable vote of the Division was registered on May 26, 1914. The formal petition was promulgated on January 10, 1915, and the favorable vote was recorded on March 18, 1915. The petition of this group was so strongly approved and the field of growth seemed so desirable that the Fraternity gave it an almost unanimous endorsement. The new group, to be known as Delta Omicron Chapter, enters the Brotherhood, therefore, under very promising and auspicious circumstances. We extend it a cordial welcome, confident that it will not disappoint its friends, but will grow into a secure place of helpful service among our sisterhood of strong and self-reliant Chapters. 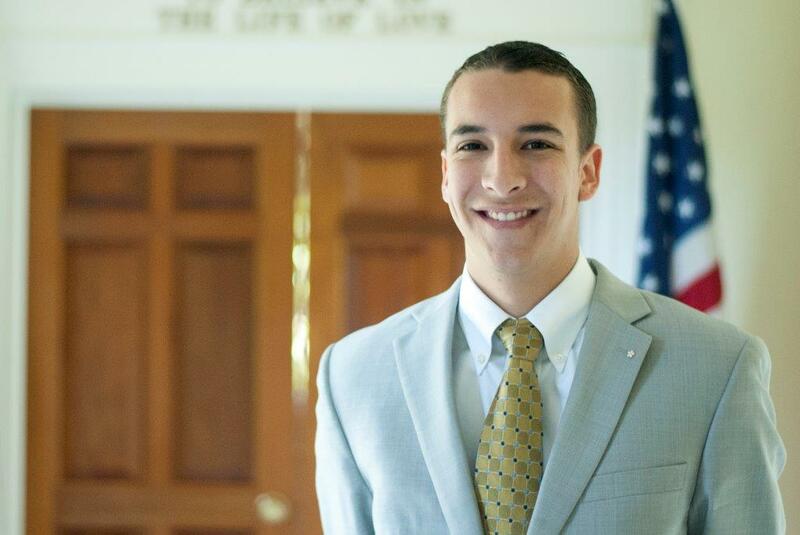 Veteran staff member Adam Bremmeyer (Washington State) departed the General Fraternity staff team in March after four years of dedicated service. 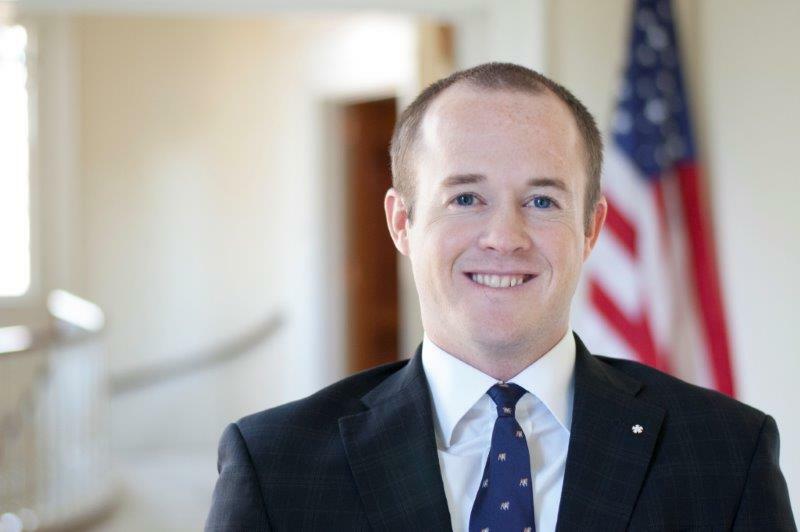 During his tenure with the General Fraternity, Adam served as Director of Expansion and Recruitment where he worked to revitalize the fraternity’s colony petitioning process and played a central role recruiting future Knights for 14 different expansion projects, including two that went on to become Rock Chapters. Bremmeyer also served as an Expansion and Recruitment Consultant and Leadership Consultant. Adam is now residing in central Washington with his wife and infant daughter where he works as a finance manager for a real estate company. 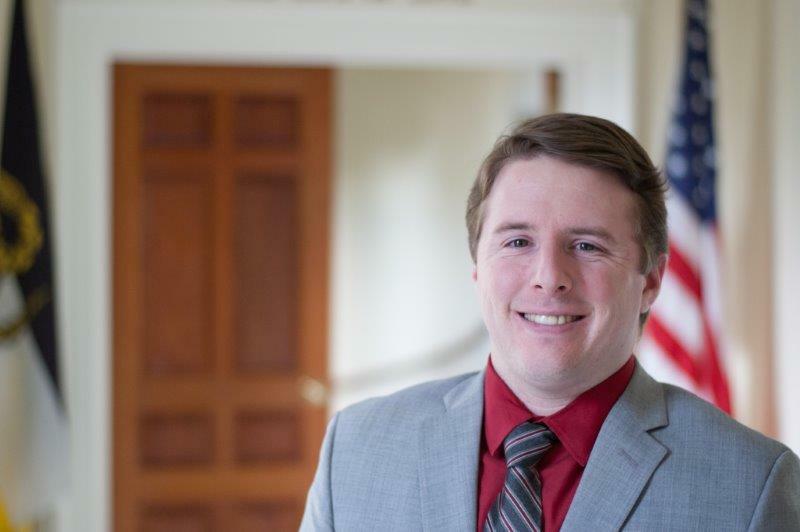 Sigma Nu Educational Foundation staff member Geoff Doran (Drury) began a new phase of his career journey in March after four years with the Educational Foundation. Doran joined the SNEF staff in January 2011, where he served as Director of Development and was vital in the success of the 1869 Club. Brother Doran is now pursuing entrepreneurship full-time. 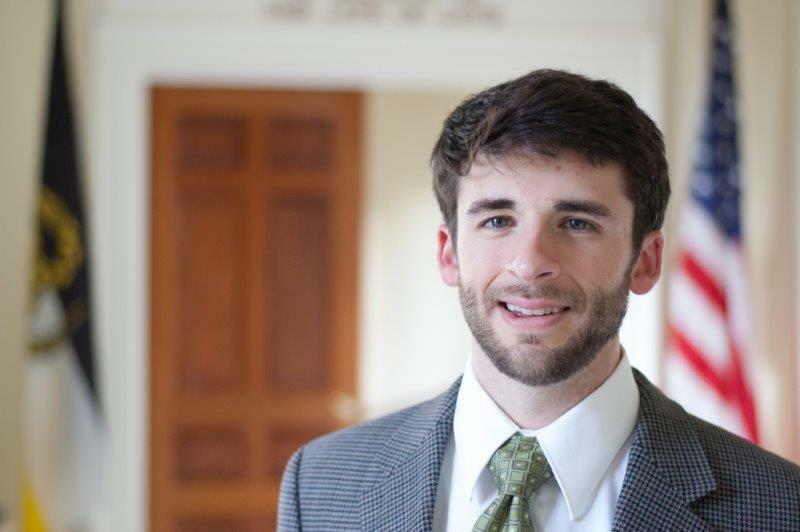 Ben Nye (Arkansas) concluded his four-year tenure with the Headquarters Staff team in June. 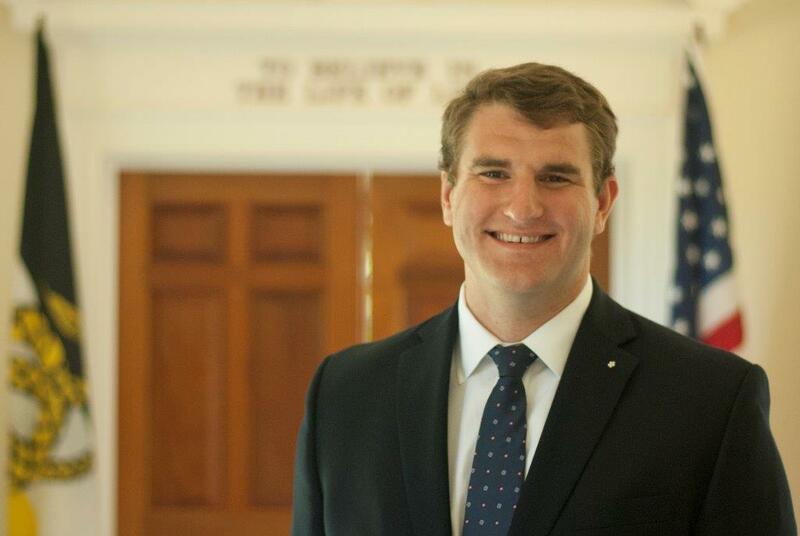 Brother Nye served as Associate Director of Communications where he edited and wrote for The Delta and managed the Fraternity’s social media accounts. Nye also served for six semesters as a Leadership Consultant. Ben is now enrolled at Washington and Lee University School of Law. Leadership Consultant Matt Miller (Mount Union) has completed his two year tenure. 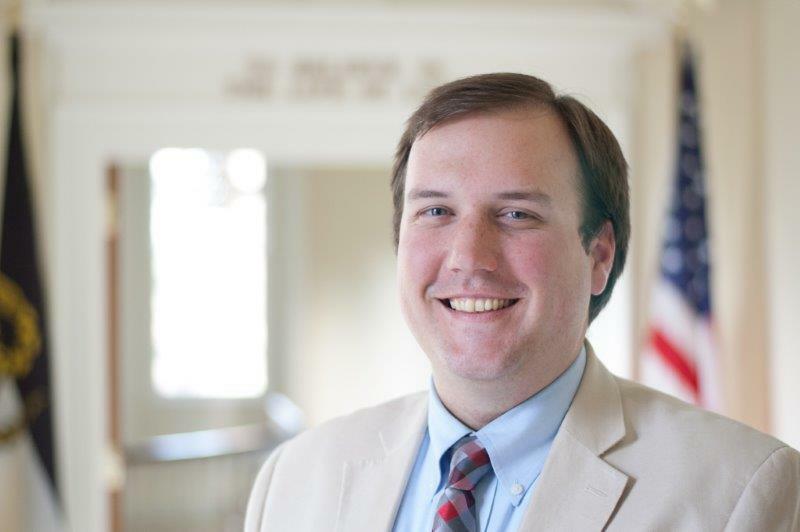 While serving as a consultant, Miller worked with Sigma Nu chapters in the West Region, was a facilitator at College of Chapters, and was primary staff liaison to the Appeals and Grievances Committee at the 66th Grand Chapter in Nashville, Tenn.
Drew Logsdon (Western Kentucky) has taken over as Associate Director of Communications after four years of service as Associate Director of Risk Reduction. Leadership Consultant Tyler Richter (South Florida) is now serving as Associate Director of Risk Reduction. This June saw the arrival of four new Leadership Consultants who will begin their travels in August. Zach Eisenman, Raymond Fackler, Travis Galloway, and Shekhar Hazarika will continue as consultants for a second year. 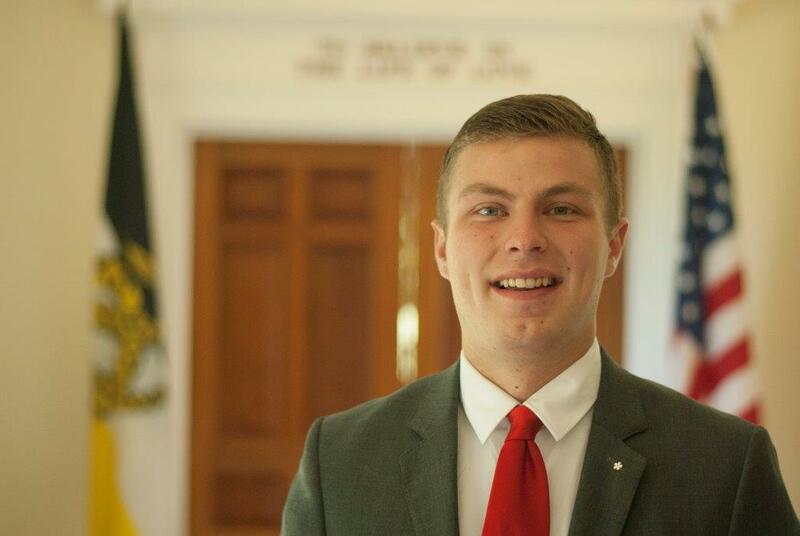 Mark Gockowski (Kent State) graduated with a degree in broadcast journalism and served the Zeta Gamma Chapter as Commander, Recorder, Alumni Relations Chairman, and IFC delegate. He also was on the IFC executive committee and served on the Chapter Eternal Committee at the 66th Grand Chapter. 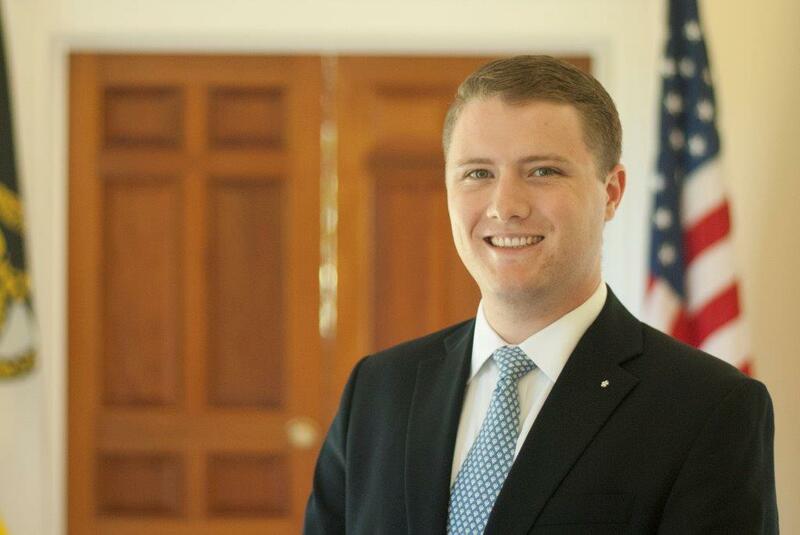 James House (UC Santa Barbara) graduated with a degree in political science and served the Kappa Eta Chapter as a three-term Commander. House also worked in the Greek affairs office and was a member of the Ritual Committee at the 66th Grand Chapter. James House (UC Santa Barbara). 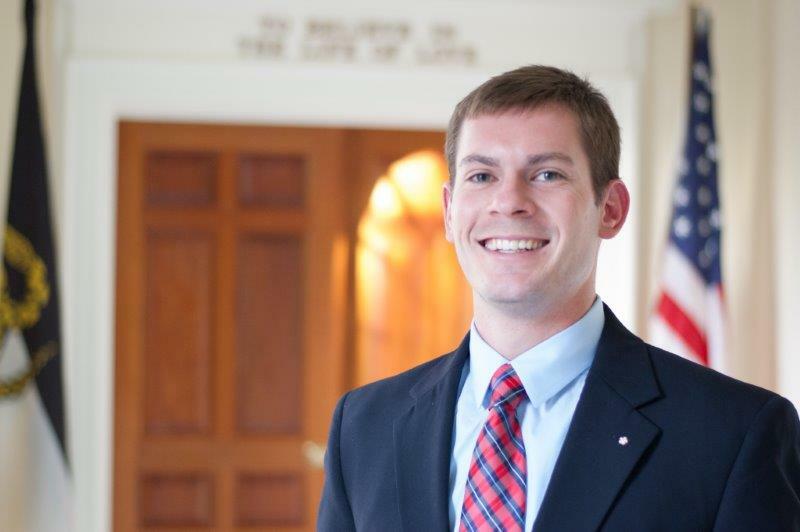 Evan Winebarger (Georgia Southern) graduated with a degree in therapeutic recreation and served as Commander and candidate class president of the Theta Kappa Chapter. Winebarger also served as an IFC liaison and has worked as a business productivity advisor for Microsoft and N3 Results. 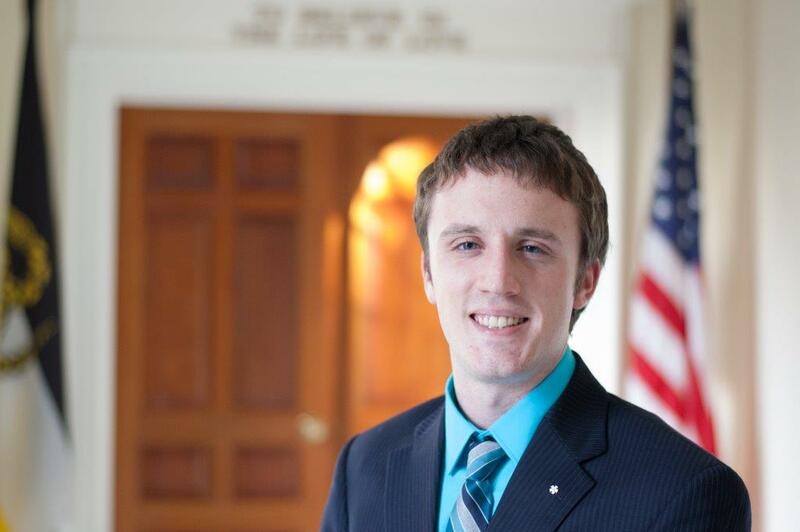 Alex Retzloff (Washington and Lee) graduated with a degree in history from Washington and Lee where he served as Treasurer and Commander of the Lambda Chapter. Alex Retzloff (Washington and Lee). In the early morning hours of February 27, the shed containing maintenance equipment and heating, cooling, and electrical services to the Headquarters Shrine caught fire. 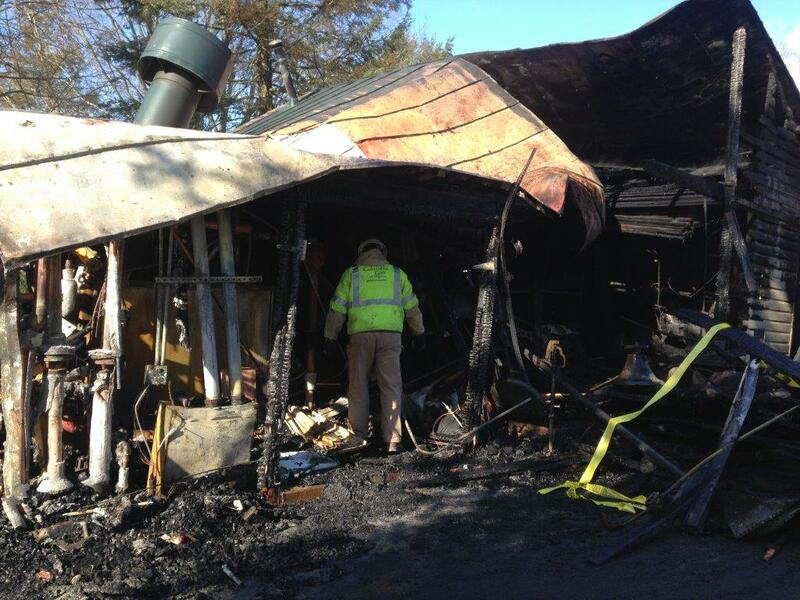 The fire, caused by an electrical wire malfunction, rendered the shed and all its contents completely unsalvageable. This left Headquarters without power, heating and cooling. Temporary systems were put in place to provide heat and electrical services, and currently work is being completed on a permanent structure to house new heating and cooling equipment. In the latest issue of The Delta we’re pleased to present a collection of feature stories that highlight four brothers we can all be proud of. We start with a duo of young upstarts whose entrepreneurial acumen helped them found two remarkably successful companies at early ages. 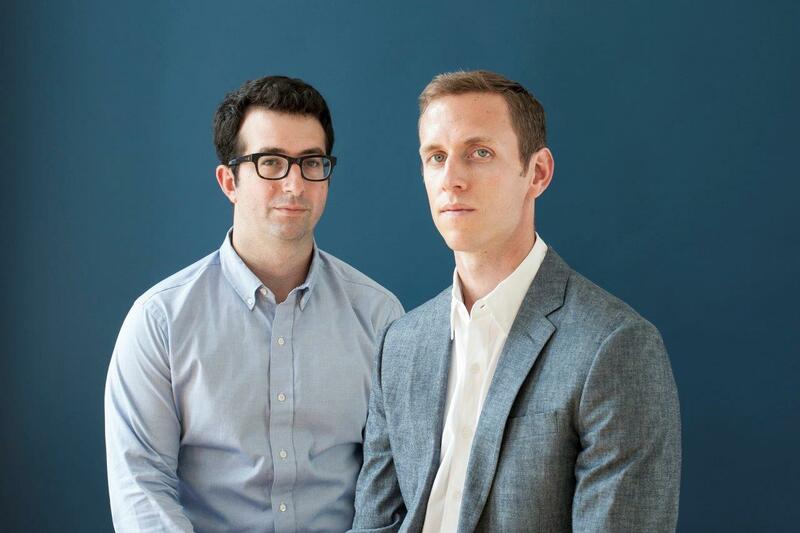 Andy Katz-Mayfield (Duke) and his co-founder set out to make Harry’s the go-to online retailer for men’s shaving products that would dethrone the overpriced legacy brands. With equally ambitious goals, tech startup DataRank, founded by Ryan Frazier (Arkansas), uses complex algorithms to help Fortune 500 companies make decisions about products and consumer insight. Both companies have earned the attention of venture capitalists, with investors lining up to facilitate their growth. Our third feature story chronicles the career of another successful entrepreneur, though one who’s been in business longer than Harry’s and DataRank combined. 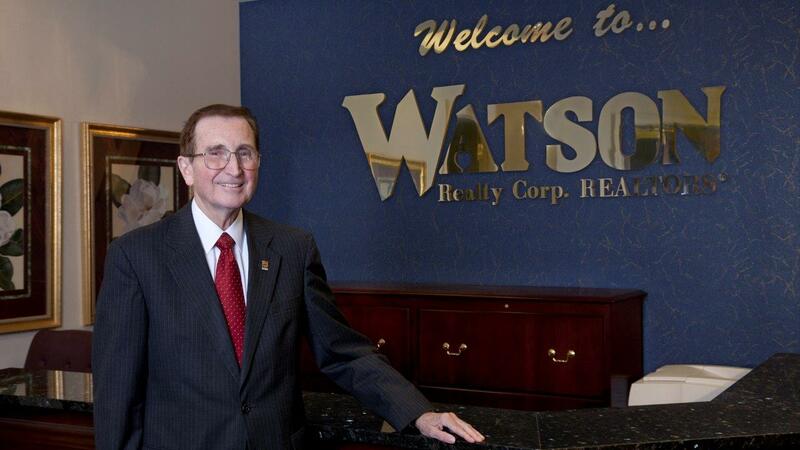 Bill Watson (Stetson) founded Watson Realty Corp. in 1965 and now operates 43 real estate offices and 29 property management offices in Florida and Georgia. This year Watson Realty Corp. celebrates 50 years, the longevity for which Bill attributes to the company’s reputation for sound ethics and legendary quality of service. Upon first glance our food-themed cover feature may seem out of place next a series of stories about successful entrepreneurs. Take a closer look, however, and you’ll realize why a high-functioning professional pastry chef demands many of the same traits required of successful startup founders. 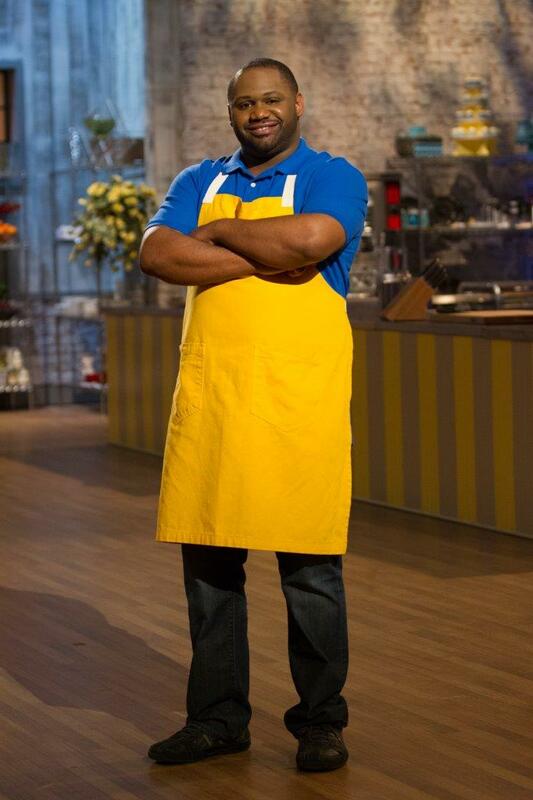 As Dwayne Ingraham (Southern Mississippi) demonstrates on Food Network’s Cutthroat Kitchen, achieving success in the hyper-competitive restaurant world requires the same commitment to clear vision, strong leadership, and thinking fast under pressure. 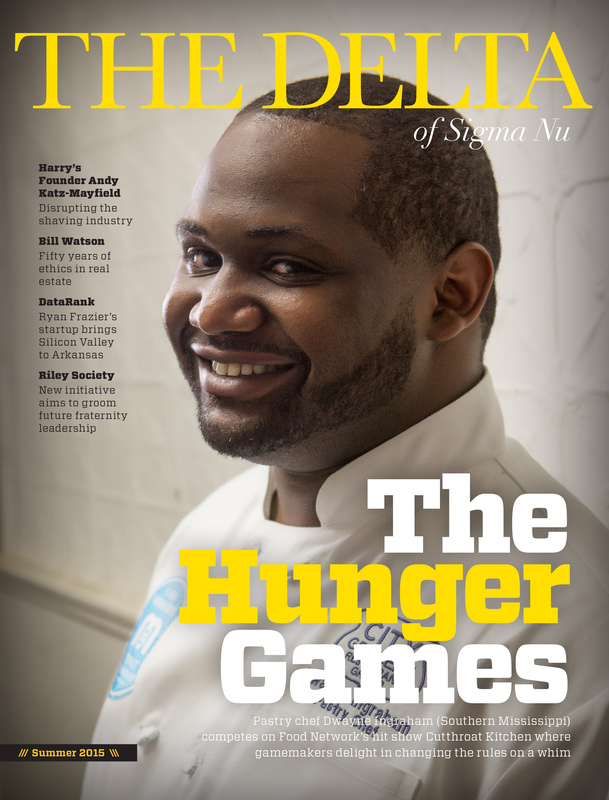 When you read each of these feature stories you’ll notice one other thing they all have in common: each one traces career origins back to their Sigma Nu experience. Andy Katz-Mayfield speaks to the importance of surrounding yourself with people who share your vales. Ryan Frazier credits his chapter with fostering an energizing culture that provided positive role models. To this day Bill Watson remains thankful for the emphasis his chapter placed on excelling in the classroom. Dwayne Ingraham was inspired to attend culinary school thanks to one of his fellow candidates; another chapter brother accompanied him on the 22-hour drive from Mississippi to Vermont where his culinary career began. We hope you enjoy these stories and the rest of the Summer 2015 issue. We welcome your feedback and suggestions for stories we should consider in a future issue. How does one possibly prepare for the Hunger Games of food shows where organizers can change the rules on a whim? “Trust your knowledge, trust your skillset, and keep things simple.” Photo courtesy of Food Network. The episode begins when host and Food Network megastar Alton Brown introduces the contestants. Chef Jackie from New Jersey. Before each round contestants have 60 seconds to shop for everything they’ll need. What Alton calls “shop” is better characterized as a stampede to a fully-loaded pantry where contestants jockey for position to grab as many items as they can carry. When the free-for-all ends Alton shuts the doors and the contestants return to their station and attempt to formulate a recipe from the ingredients they grabbed from the pantry. Next comes the auctions. Each of the four competing chefs receive an equal share of $100,000 in cash that’s stored on set in a silver suitcase. The contestants use this money to bid on auction items that will sabotage other contestants. The catch is that they only leave the show with the money they have remaining – and that’s only if they win. Round 1 begins. Each chef must make a molten lava cake with whatever ingredients they happened to grab from the pantry. No sooner than the chefs get started with their game plan for Round 1, Alton tosses the first curve ball. The first package of items up for auction is a dozen roses, a wine flute, and an empty box of chocolates. The winner of this auction can require his opponents to forfeit all of their utensils and vessels in return for the three items. Dwayne wins the first auction and forks over $6300 of his $25,000 for the luxury of baking with real utensils and mixing bowls. His opponents aren’t so lucky. Chef Jackie must stir her cake mix in the cheap plastic that comes with grocery store flowers; Chef Ben gets to stir his mix in a wine flute; and Chef Stef gets a flimsy box of chocolates in place of a mixing bowl. Before the contestants proceed any further Alton announces the next auction, and it’s not good. The winner of this one gets to confiscate one opponent’s chocolate. That means no chocolate to make a chocolate molten lava cake. Dwayne being the skilled and savvy chef that he is realizes he has enough cocoa from the ingredients he grabbed from the pantry and decides to let this one go. Chef Ben wins the auction and predictably takes Dwayne’s chocolate. At this point things are going well for Dwayne – that is, as well as they could be, all things considered. His opponents are baking with significant handicaps. Meanwhile, Dwayne’s weathered the storm by improvising the chocolate flavor with cocoa, flour, and sugar. Right when things are going well Alton throws another auction that forces two contestants to hold hands for the rest of the round. Dwayne smartly passes on the bidding because his cake is nearly ready for the oven. He’s tethered with Chef Stef, but no harm done as Dwayne is well prepared for the obstacle. 5…4…3…2…1. Round 1 ends and Alton brings out celebrity chef Simon Majumdar to judge the molten lava offerings. Simon runs down the line, sampling each one and offering his comments. The drama builds as Simon determines who to eliminate. He zeroes in on Stef’s molten lava cake that’s missing a key characteristic: the lava. Simon sends Chef Stef packing; three chefs remain going into Round 2. On a typical day Dwayne arrives at work by 7:00 a.m. and promptly begins reviewing prep lists from six different restaurants that operate under City Grocery. Dwayne and his team review all the orders received overnight and account for how much each store sold the previous day. They also stay busy providing catering for offsite events. During college football season, this means fulfilling hundreds of orders for tailgates, including The Grove – one of college football’s most renowned tailgating locations. When ESPN’s nationally-televised College Gameday visited Oxford for the Ole Miss vs. Alabama game last fall, Dwayne didn’t go home from Thursday morning until Saturday afternoon. One of Dwayne’s two assistants had just left, leaving him down a man on the busiest weekend of the year. “You just learn to do what you need to do,” he says, reflecting on that hectic weekend. On the day I spoke with Dwayne he was prepping for a party of 145 people. “After reviewing the prep lists we start attacking the day,” he says. On top of preparing bulk orders for parties and other catered occasions, Dwayne has to prepare orders for the restaurant where he works, which opens at 11:00 a.m. I asked Dwayne how he ended up at City Grocery in Oxford – the idyllic college town home to the University of Mississippi that’s built a reputation for its thriving restaurant scene. “I was in Las Vegas at the time,” he recalls. 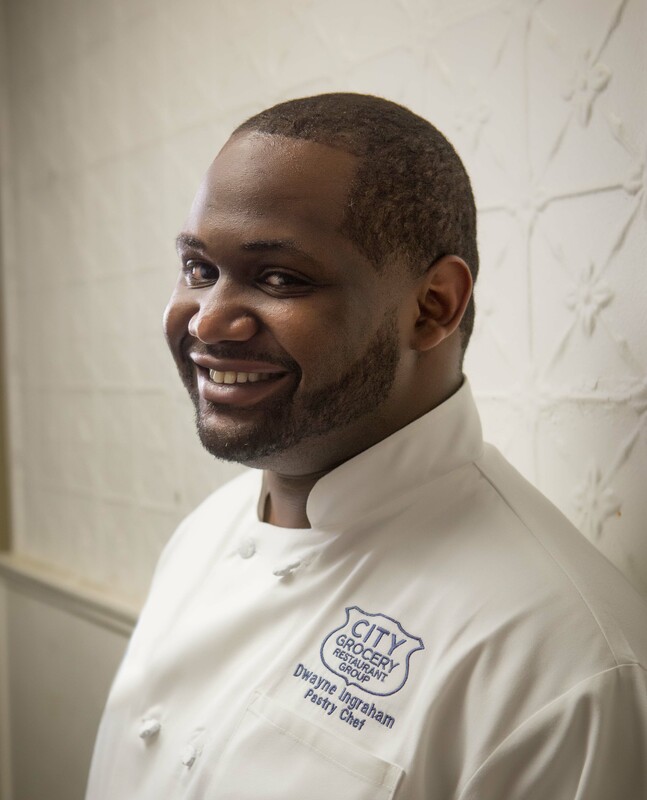 It was 2010 and John Currence, City Grocery’s owner, posted a job opening on the alumni page for the culinary school Dwayne attended. At the time Dwayne was putting his time in as a line chef at Wynn Las Vegas casino-hotel. The work was grueling, but a necessary part of learning to run a restaurant. Dwayne was ready to make the jump to full-time pastry chef and applied for the job. The two connected immediately through common geography. John was from New Orleans, and Dwayne was from nearby Boothville, La. “John went fishing in my hometown,” Dwayne recalls. Each of the four competing chefs receive an equal share of $100,000 in cash that’s stored on set in a silver suitcase. The contestants use this money to bid on auction items that will sabotage other contestants. The catch is that they only leave the show with the money they have remaining – and that’s only if they win. Photo courtesy of Food Network. When Dwayne decided to attend University of Southern Mississippi his mom worked with a lady whose son was Commander of the Theta Gamma Chapter at the time. “Every time I visited campus Kenny showed me around. When I arrived for orientation they all showed up to help me move in,” he remembers. Dwayne got the idea to attend culinary school thanks to one of his candidate brothers at Theta Gamma Chapter. Gerald Peralta was planning to attend culinary school and Dwayne realized he would enjoy pursuing the same track. “As soon as I took a baking class I knew that was what I wanted to do,” he remembers. Dwayne eventually left Hattiesburg for the New England Culinary Institute in Montpelier, Vt. Another one of Dwayne’s Theta Gamma candidate brothers, Markus Jones, accompanied him on the 22-hour drive to Montpelier, which sits about 70 miles from the Canadian border. They took turns driving for two days, taking a nighttime detour through Lexington to visit the Headquarters Shrine on the way to Vermont. Dwayne went straight to Las Vegas after completing culinary school. The restaurant scene in Vegas was quickly building a highly regarded reputation, and Dwayne knew there would be good opportunities for him out there. Dwayne was eager to escape the cold weather, so naturally it snowed his first winter in Las Vegas. Back in the Food Network studio, Alton Brown delivers the next challenge for the remaining contestants. Each chef has 30 minutes to make a savory chocolate dish. When the timer starts the three remaining contestants repeat their stampede to the kitchen pantry. Dwayne returns to his cooking station when he realizes he left the pantry without grabbing a protein. Chef Jackie wins the first auction and forces Dwayne to somehow incorporate a hunk of halibut with his chocolate savory dish. The chef from New Jersey makes it clear she hasn’t forgotten Dwayne stealing all her utensils in Round 1. “Chef Dwayne is the target,” she says with pleasure. Simon returns to judge the dishes. “Combining fish with chocolate is brave,” he says, as if Dwayne had a choice. Unfortunately Dwayne’s halibut is slightly overcooked and Simon notices right away. Things aren’t looking good for Chef Dwayne right now. Simon samples the remaining dishes and offers the usual pros and cons for each one. No one entered the judging session with more confidence than Chef Ben. But things quickly go downhill for the tattooed chef from Indianapolis as it turns out his chilaquiles recipe was too sweet for what was supposed to be a savory dish. 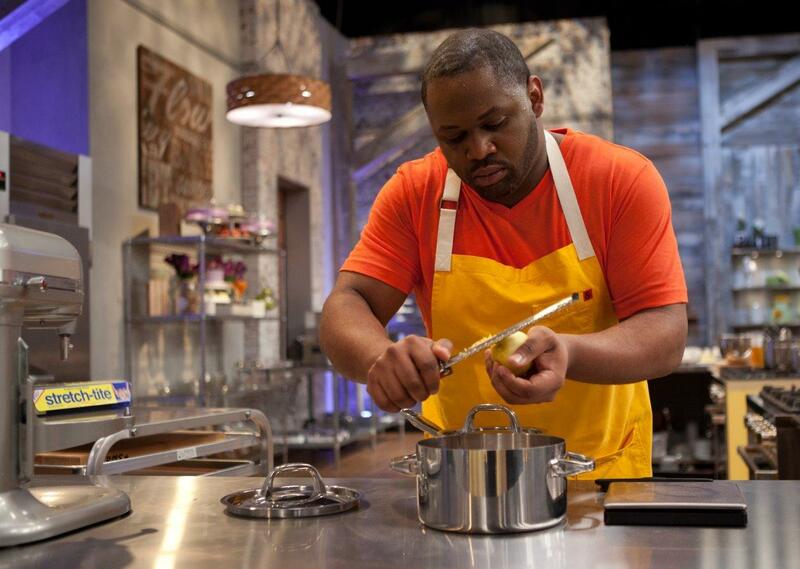 Simon eliminates Chef Ben, leaving Dwayne and Jackie to compete for the final round. The process for getting on Cutthroat Kitchen started with a Facebook message. The casting company contacted Dwayne because they wanted to shoot a specialty episode devoted to chocolate. “I was honored they asked me to apply,” he says. Dwayne completed the application and agreed to a Skype interview with the Food Network team. A few weeks later Dwayne learned he had made the show. Dwayne got the idea to attend culinary school thanks to one of his candidate brothers at Theta Gamma Chapter. “As soon as I took a baking class I knew that was what I wanted to do.” Photo by Steven Rosen/www.stevenrosenphotography.com. They shot the episode on August 19, the day before Dwayne’s birthday. They flew the contestants to Los Angeles and covered meals and lodging. All clips were taped the following day. A single episode of Cutthroat Kitchen takes 14 hours to film. During this time they film three challenges in the studio kitchen as well as the personal interviews with each contestant, often referred to as the “confessional camera.” The format of the show is designed in a way that encourages the contestants to sabotage each other – hence the name Cutthroat Kitchen. Professional chefs, it turns out, are not programmed bots trained to perform the same task over and over. ‘Cutthroat’ contestants have to be skilled multitaskers, stirring a molten lava cake mix while managing their budget to bid on items in real time. “You have to think fast on the show,” Dwayne says, not unlike a typical day in the restaurant. It’s down to two: Jackie vs Dwayne, New Jersey vs. Oxford, Miss. During his 60 seconds in the pantry, Dwayne grabs dark chocolate, white chocolate, oranges, peanut butter, and graham crackers. When he returns to his cooking station he realizes he’s forgotten heavy cream – a critical ingredient for truffles. “Such a rookie mistake,” he concedes to the confessional camera. “You can’t make truffle centers without heavy cream. I’m so screwed.” Or is he? We’re about to find out. Alton announces the first auction of the third round, the opportunity to force your opponent to forfeit all ingredients and rely on what’s inside a giant mystery box of chocolates. Dwayne wins with a bid of $9,000, which is $100 more than the total amount Jackie has remaining. Dwayne’s strategy of conserving funds in the first two rounds pays off. Jackie is left reaching into mystery vats of chocolate to find her ingredients – a scene reminiscent of Nickelodeon’s 1990s classic, Double Dare. Realizing his error in forgetting heavy cream, Dwayne thinks fast and decides to make his own variation of s’mores with the graham crackers and white chocolate for marshmallow. Jackie ends up making truffles with dried apricots, raspberry, strawberry, and jalapeno. Her cooking station looks like a disaster zone from all the spilled chocolate. “The presentation is really good. You’re obviously really skilled. The graham cracker was a terrific idea.” Simon is clearly impressed with Dwayne’s s’mores idea, but his final decision is still up in the air. Dwayne, right, plans to use his winnings from Cutthroat Kitchen for the wedding he’s planning with his partner, Jeff. 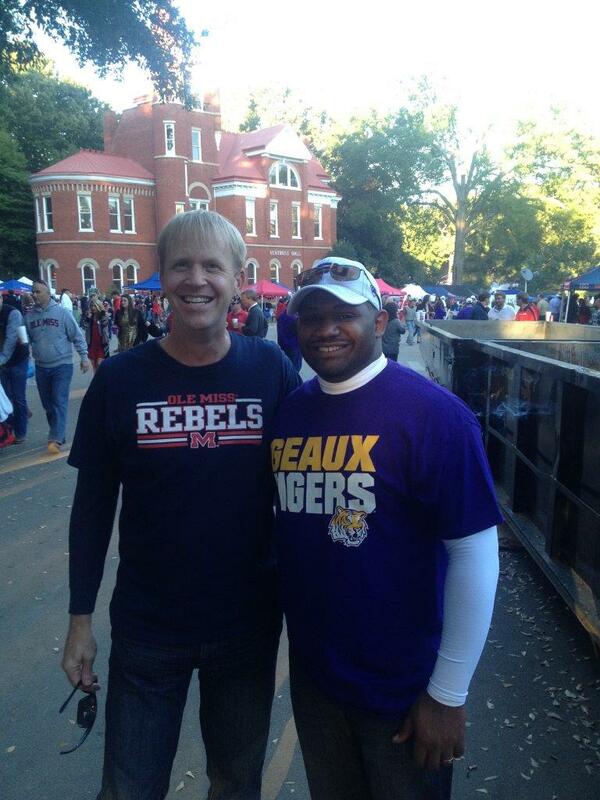 Pictured here before a recent LSU at Ole Miss football game. The partnership between Andy Katz-Mayfield (Duke), right, and Jeff Raider was a natural fit after they met interning at the same Boston management consulting firm. They worked together at several companies and shared similar passions for designing quality products. “We have a very strong value alignment,” says Katz-Mayfield. A startup founder’s quest for an authentic shave and values-driven entrepreneurship. That day at the drug store proved a turning point for Katz-Mayfield. He walked out of the store and phoned friend Jeff Raider who, at the time, was an executive at online eyewear startup Warby Parker. Katz-Mayfield pitched Raider an idea for a new company that could manufacture inexpensive, high quality razors that could be sold directly to consumers online. So began Harry’s. 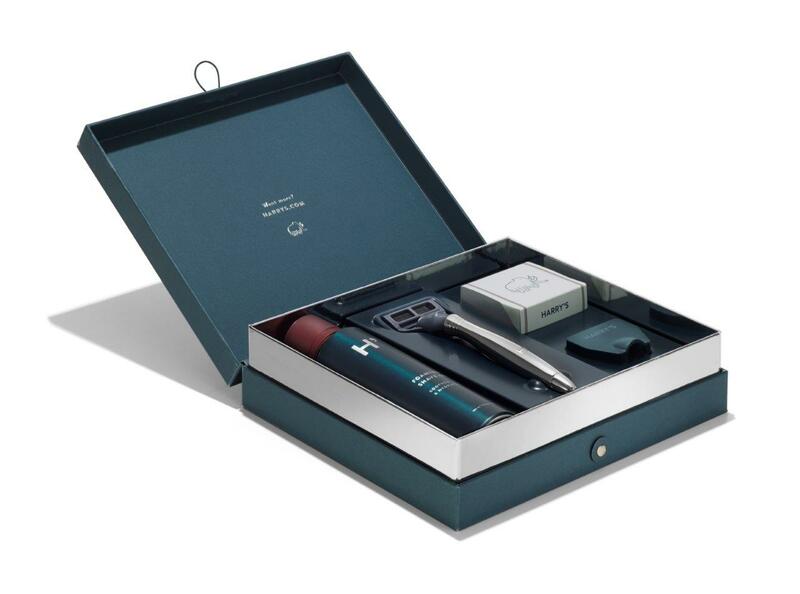 What started with Katz-Mayfield’s frustrated customer experience has now grown into a men’s grooming company of over 100 employees with a backing of over $200 million in investor capital. Equally impressive is Harry’s 2014 acquisition of a German factory that will allow it to take on men’s shaving industry leaders like Schick and Gillette. With the factory, Harry’s is producing and shipping their razors to its nationwide, online customer base. Long before setting out to create a new razor company, Andy Katz-Mayfield and Jeff Raider had solidified their relationship. During their undergraduate days, Katz-Mayfield at Duke and Raider at Johns Hopkins, both interned at the Boston management consulting firm Bain & Company. The two continued their professional relationship after college while at Charlesbank Capital Partners, a private equity firm in New York. It was at Bain and Charlesbank where the pair sharpened their business and management skills through exposure to a variety of different organizations and industries. Katz-Mayfield and Raider’s partnership was a natural fit. They were both passionate about designing quality products, building a brand that resonated with the modern man, and creating a better overall customer experience. “For Jeff and I there was a real deep level of trust and understanding. We have a very strong value alignment,” Katz-Mayfield says. After Katz-Mayfield pitched Raider his idea in October 2011, the two began studying design principles of common, hand-held tools. Finding what they liked best and most functional about those tools, Katz-Mayfield and Raider drafted several concepts they wanted in their new razor. After studying the design principles of common, hand-held tools, Katz-Mayfield and Raider settled on their prototype that would become the Harry’s razor. At the same time, the pair sought a manufacturing partner that could design and produce their concept for a new razor, what they call the Gothic Arch. The Gothic Arch is a technology that ensures the razor blade is strong yet also is extremely sharp at tip. “We knew we couldn’t build a brand if the product quality didn’t stand up,” said Katz-Mayfield. This process proved challenging as only a few factories in the world have mastered the technology that Katz-Mayfield and Raider needed. After sampling a variety of products with no success, Katz-Mayfield and Raider considered abandoning the project. Yet, in January 2012, the pair achieved the breakthrough that made Harry’s a reality. Katz-Mayfield and Raider discovered Feintechnik, a German company that had manufactured razors for 95 years. They liked Feintechnik’s quality and the cost was low enough to allow Harry’s to compete in the men’s shaving market. A partnership was solidified that ensured Harry’s would manufacture their razors through Feintechnik. With the relationship established, Harry’s began building its team, designing a brand and website, and creating the Harry’s 5-blade cartridge and other key features of its razor technology. Katz-Mayfield and Raider launched Harry’s in March 2013, after building the company for over a year and securing intellectual property protection for their designs. 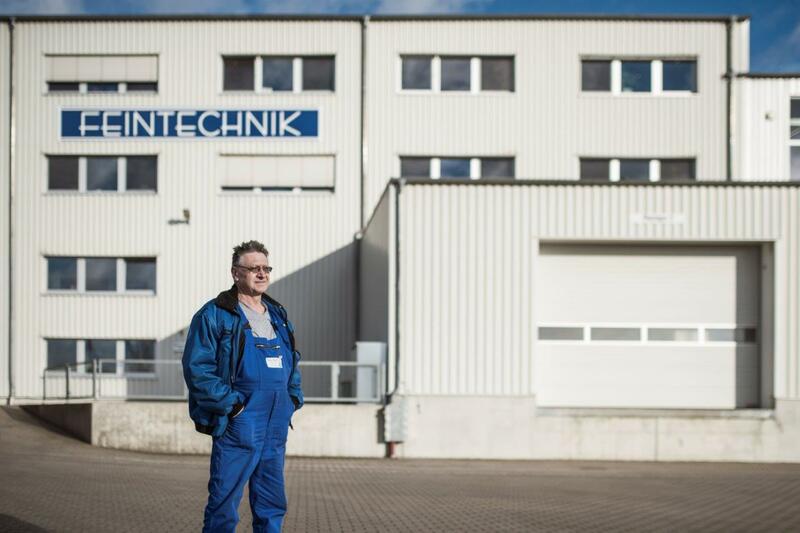 After almost a year of successful operations, Harry’s moved to further shore up its operations by purchasing Feintechnik outright in January 2014. Purchasing Feintechnik was big for Harry’s. As Katz-Mayfield pointed out, Harry’s is now vertically integrated, meaning it can cut the cost and time that come with shipping products from an outside supplier. The company can now develop their own razors in-house and experiment with new designs without the down side of paying for expensive trials and demos. On at least one occasion, Harry’s has tweaked its razor design based on feedback from customers, a process that would have been much more difficult without owning Feintechnik. The flexibility to make design changes quickly and inexpensively gives Harry’s the edge it needs to stay competitive. “Along with Schick and Gillette, Harry’s is the only other company in the shaving category that controls design, manufacturing, and direct sales of their product,” wrote Phil Johnson, a contributor to Forbes. A KEY INGRIDIENT of Katz-Mayfield and Raider’s entrepreneurial philosophy is authenticity which can be seen in all aspects of Harry’s culture, from its practically crafted razors to the company’s management strategy. As Katz-Mayfield explains, the primary component of this authenticity is focusing on the underlying problem that Harry’s addresses. “It’s a lot easier to build a company that solves a problem that you empathize with, as opposed to trying to solve someone else’s problem. We’re not trying to create a brand that we thought would be cool or aspirational, but instead creating a brand that resonated with us personally,” said Katz-Mayfield. In 2014, Harry’s acquired Feintechnik, a German company that had manufactured razors for 95 years. Feintechnik helped Harry’s solidify its design and is helping it to compete with shaving industry leaders. Katz-Mayfield doesn’t believe that having a great idea makes an entrepreneur successful by itself. “Oftentimes in entrepreneurship the ideas are glorified. My experience was that the idea was 10% of it and then 90% of it was focusing on execution and operations.” This isn’t surprising considering that Harry’s – unlike many new startup companies – creates a physical product that is sold directly to consumers. In contrast with startups that focus on software or app creation, Harry’s has to effectively manage supply chain and manufacturing along with sales and design. Inside the Feintechnik factory where Harry’s manufactures high quality blades. Katz-Mayfield attributes much of his success as an entrepreneur to the strong team that has surrounded him. At Harry’s, Katz-Mayfield and Raider have hired people who excel. “Everybody we hire should be better at what they do than what we are,” said Katz-Mayfield. Much like fraternity recruitment, Katz-Mayfield indicated that it’s important to go beyond simply what potential new hires say they believe in. Hiring appropriately requires investigation by the potential employer. “Nobody will say, ‘No, I don’t believe in honesty.’ It’s actually observing behavior and truly figuring out if those things are aligned,” said Katz-Mayfield. It’s also important for employers to ask how applicants have demonstrated those qualities in the past. To respond to this need, Harry’s has established at least one avenue for living its values as a company. The Harry’s 1% initiative is designed to do just that. As part of the 1% initiative, Harry’s gives 1% of its sales and 1% of its time volunteering to City Year in New York. City Year is an extension of AmeriCorps which places recent graduates in cities all across the country where they volunteer and serve the local community. “Our ability at Harry’s to attract really great talent is enabled partially by the notion that people want to work for a company beyond reasons that are based solely on revenue and profit,” concludes Katz-Mayfield. For Katz-Mayfield, Sigma Nu had an excellent culture that helped form a common theme in his journey as entrepreneur. While value alignment is critical for Harry’s, this does not mean that its employees all think the same way. “Actually having a diversity of backgrounds and ways to approach problems is really valuable,” says Katz-Mayfield. This is especially important for a company like Harry’s that values constant improvement in its employees. “We are a real learning culture. What I mean by that is everybody at all levels of the organization just really wants to learn and get better.” As a young company seeking to break into an entrenched industry, the need for constant improvement and a diversity of thinking in its employees is vital. Katz-Mayfield doesn’t just see living by a set of values as something to be kept internal, it can also benefit society at large. “We look at certain constituents more broadly. It really is born out of a sense of responsibility to the broader community that we engage with. It’s about defining those values and being true to them both internally as a company and externally with consumers and customers,” he said. Katz-Mayfield recalls positively his time as a collegiate brother with the Gamma Chapter at Duke University. “Some of my best friends in life were fraternity brothers at Duke.” For Katz-Mayfield, Sigma Nu had an excellent culture that helped form a common theme in his journey as entrepreneur. 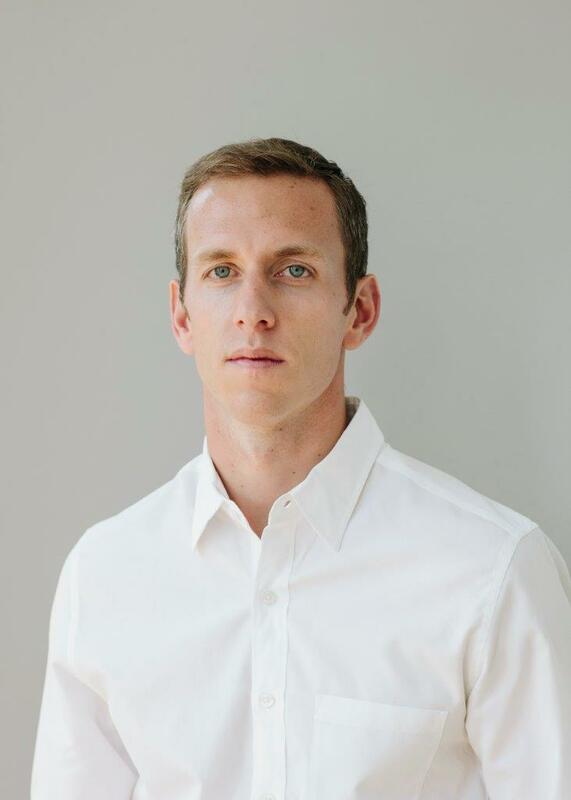 The connections he made through Sigma Nu ultimately led him to Bain & Company where he met Jeff Raider. 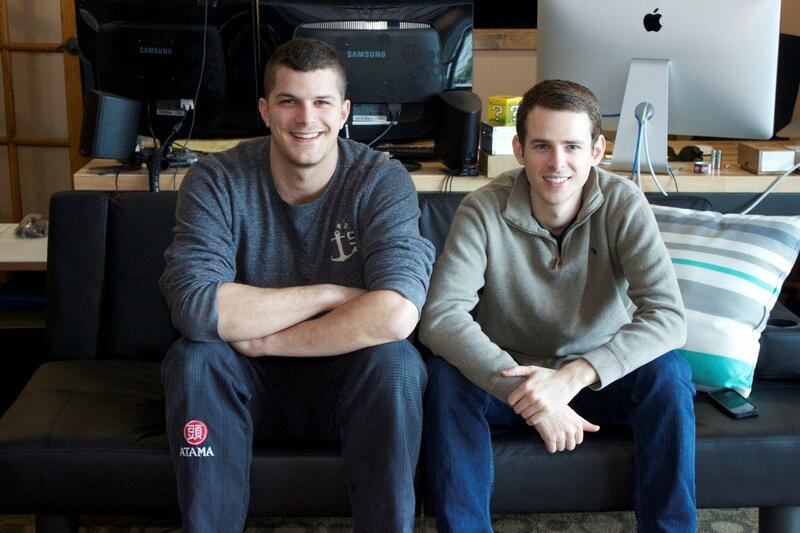 Sigma Nu has helped Ryan Frazier (Arkansas), left, build DataRank. Along with several board of director members, DataRank employs Corben Young, right, a fellow Sigma Nu brother. How an under-30 startup CEO is using big data to help Fortune 500 companies turn profits. AS OF OCTOBER, 2014, DataRank had been in its new office in Fayetteville, Ark., for a month. The office is modestly furnished, and has few flourishes and closed doors. Casually dressed workers input complex-looking code sequences into their desktops while seated at centrally located tables. There are no cubicles to be found. 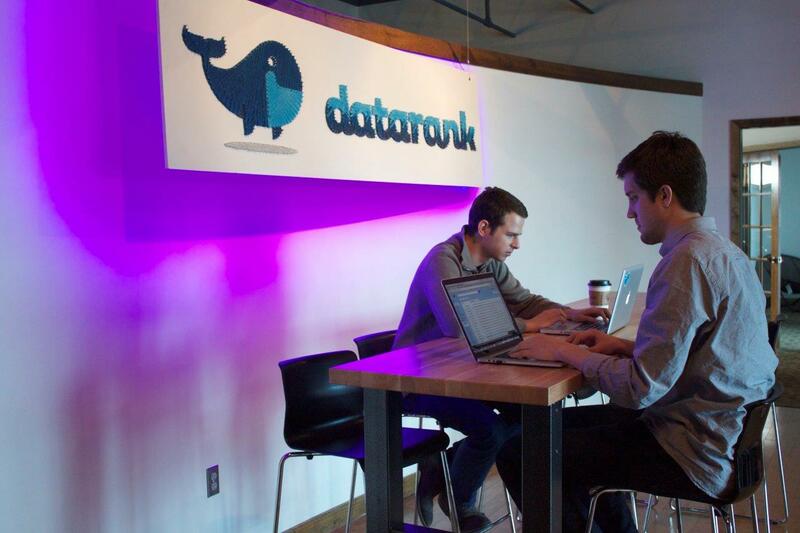 The DataRank logo — a perky blue whale — occupies a prominent place in the office and offers a possible metaphorical interpretation to the company’s business model. Like a whale, DataRank swims comfortably through a sea of social media data and reemerges from the depths with useful analysis on consumer behavior. This unique business model driven by sophisticated algorithms has given the company a competitive advantage and has Fortune 500 clients lining up to pay for access. Co-founder and CEO, 27-year-old Ryan Frazier (Arkansas), is perfectly comfortable in his role as a technology startup executive. Frazier’s low-key demeanor gives way to a keen entrepreneurial acumen that has caught the eye of investors and customers alike. Frazier and his young company have also gained attention from media outlets that cover startup news such as TechCrunch, Forbes, and Mashable. Like many entrepreneurs seeking to keep costs down, Frazier has been a jack of all trades to ensure the success of his young startup. When the company moved into its first office in 2013, Frazier and his team moved all of the furniture themselves. “These tables,” indicates Frazier seated at a long, wooden table “are incredibly heavy as you can imagine.” With its most recent move, DataRank paid for movers. It’s the second office in less than a year for the startup founded in October 2011 — the third, if counting the large house that the company’s founders lived in together. “When dirty dishes are slowing down business development or creating feuds within your coworkers, that’s not an ideal situation,” Frazier recalled. The new office came towards the end of what proved a banner year for the three-year-old startup. In February 2014, DataRank received $1.4 million in capital from a combination of investment firms that specialize in technology startups. What’s more, DataRank doubled the employees on its payroll in 2014 while surpassing its sales goals every month. AT ITS HEART, DataRank is a technology company. Nowhere is this more evident than the company’s leveraging social media data for its customers. Using its algorithms, DataRank reviews large swaths of information and then sorts and ranks it based on relevance to specific products or brands – a process that Frazier compares to operating a search engine such as Google. “At the simplest level it’s a tool for companies to learn about their customers,” says Frazier. Frazier, right, along with Chuong Nguyen (not pictured) and Kenny Cason, left, moved to Fayetteville, Ark. in 2011 to found DataRank. While DataRank isn’t unique in providing customer insights, its sources and methodology have distinct advantages. DataRank has a much broader scope and provides more timely information than traditional customer insight methodologies such as focus groups and surveys. Unlike focus groups and surveys, DataRank is not limited to the responses of a preselected group nor to time constraints. Instead, DataRank gathers information from online conversations as they occur on Twitter, Facebook, and other social platforms and then provides an ongoing, real-time survey. The potential data source is also growing. A July 2014, article in the Wall Street Journal estimated that there are 1.32 billion monthly Facebook users and 271 million Twitter users. In essence, there is a global conversation about products and brands for those with access. Along with the ever growing sources for what they call “social listening,” DataRank is in ideal position to take advantage of the surprisingly rich business climate of its home in Northwest Arkansas. Consisting of four cities: Fayetteville, Springdale, Rogers, and Bentonville, Northwest Arkansas is home to several large, well-known companies. Wal-Mart, the world’s largest retailer, calls Bentonville home. Tyson Foods and JB Hunt trucking – fellow Fortune 500 companies – are in neighboring Springdale. Benton County, the home of Wal-Mart, has seen its population grow from 97,000 in 1990 to over 221,000 in 2010. Spread across the region are over 1,600 consumer goods companies attempting to sell their products in Wal-Mart. Known for its efficient supply chain, Wal-Mart has a reputation for being quick to change the products carried on its sales floor. DataRank’s ability to show how customers react to brands and products on social media is a tremendous boon for suppliers wanting shelf space in the world’s largest retailer. This is just what DataRank has done with several Fortune 500 clients that carry products in Wal-Mart. While DataRank has seen great success through its three year history in Northwest Arkansas, this is hardly the norm for most startups, despite their perception as overnight success stories. According to a recent report in The Wall Street Journal, an estimated three out of four startups don’t return a dime to their investors. On their own, innovative ideas don’t make startups successful. “Cash is king in startups and they have managed exceedingly well,” explains University of Arkansas entrepreneurship instructor Jeff Amerine. 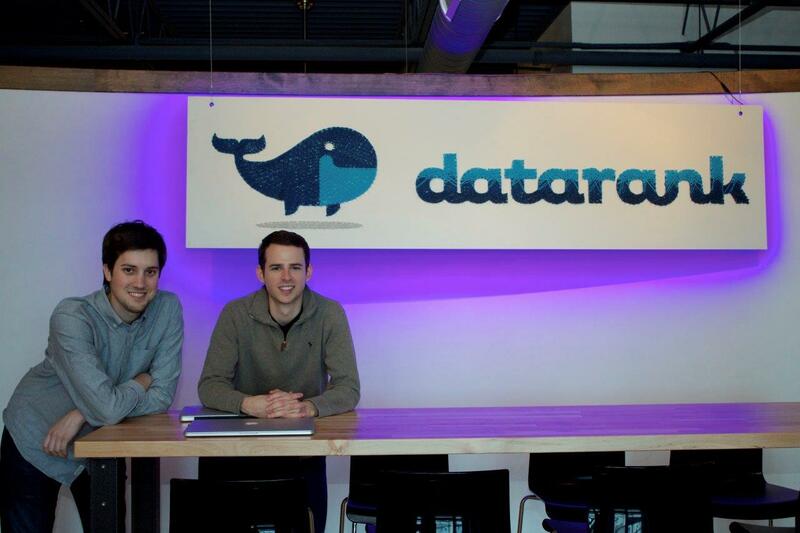 “The DataRank team is innovative, frugal, and agile. The founders have been very, very capital efficient.” Making a startup successful also takes lots of hard work, the kind that caught the eye of DataRank board of director’s member and fellow Sigma Nu alumnus Brian Henley (Arkansas). “They have a culture there of a lot of hard working young people,” said Henley. The Silicon Valley connection goes much deeper than similarities to the HBO show. In 2013, DataRank participated in Silicon Valley’s prestigious Y Combinator program, what The New York Times has called “a sleep away camp for startup companies.” The program hosts two groups of startup entrepreneurs per year while providing mentorship and an initial investment of $120,000 for each selected startup. Previous Y Combinator alumni include prominent Internet and technology companies such as Dropbox, Airbnb, and Reddit. Frazier and his team faced stiff competition for a slot at Y Combinator before the program ever began. In 2011, Y Combinator’s founder Paul Graham listed the acceptance rate for its startup program as three percent. The program immediately preceding DataRank in the spring of 2013 had an acceptance rate of only one percent. As the first Arkansas company to participate in Y Combinator, DataRank has brought some of the Silicon Valley culture back to their home state. Like other Silicon mainstays, DataRank has its own slogan; “Best idea wins,” says Frazier. It’s not quite as disruptive as Mark Zuckerberg’s “Move fast, break things,” or repeated as often as the Valley catchphrase, “fail fast, fail often,” but it does a good job connecting DataRank back to its Bay-area roots. DataRank also favors the non-hierarchical office structure that allows for a relaxed culture. Its “flat” office culture led to DataRank’s open floor layout designed to allow team members to easily share ideas and work together on projects. The entrepreneurial journey that Frazier embarked upon when founding DataRank has been multifaceted and has included valuable lessons. However, Frazier’s experience as an entrepreneur predates DataRank’s founding in 2011. His entrepreneurial prowess became evident while still an undergraduate at the University of Arkansas. Despite his talents for entrepreneurship, Frazier did not immediately start DataRank upon graduation. Instead, Frazier took a position with an office supply company as director of marketing and sales. In his downtime, Frazier began developing the ideas and concepts that would become DataRank. “When I was working for another company all the types of things I do now were more like hobbies outside of work.” What was avocation became vocation in 2011 when, after reconnecting with former classmates Chuong Nguyen and Kenny Cason, the trio moved to Fayetteville founding DataRank. Like any entrepreneur, Frazier faces many challenges, especially staying available at all hours. “When you own your own company, there’s never a time when you’re not potentially working. It doesn’t necessarily get easier over time. As you get more familiar with what you’re doing, the stakes get higher,” Frazier says. Unlike more conventional day jobs, Frazier faces pressure that only comes when answering to investors and high-profile clients. 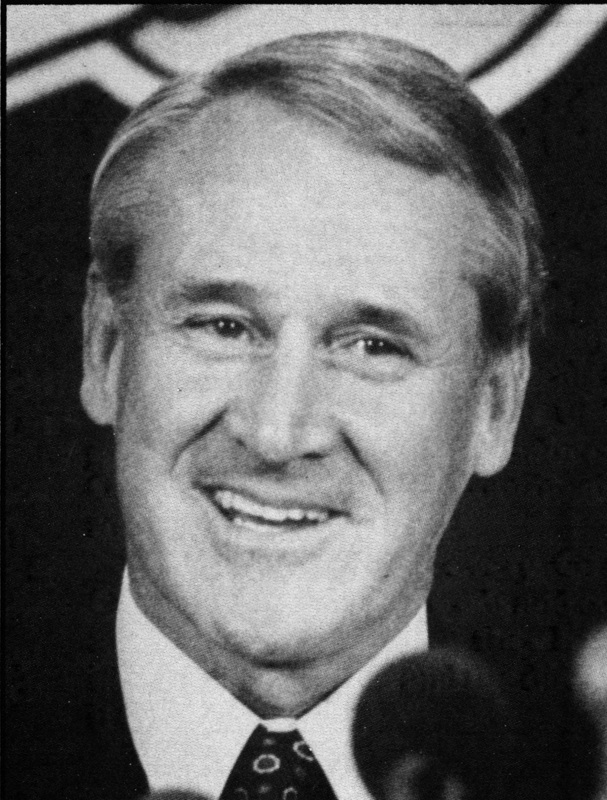 SIGMA NU has played an important role in Frazier’s development as a leader and in the development of his company. DataRank employs Brother Corben Young (Arkansas), a 2013 University of Arkansas graduate, and along with Brian Henley, has one other Sigma Nu sitting on the company’s board of advisors. It was his involvement with the Fraternity and other extracurricular activity at the University that Frazier found to be the most productive in his development as an entrepreneur. “Get involved in the leadership of the Fraternity or in other organizations that are focused on the things that you’re passionate about. Any kind of experience you can get leading these groups of 20-100 people is really valuable,” said Frazier providing advice to other would-be entrepreneurs. After founding Watson Realty Corp. over 50 years ago, Bill’s company now operates 43 real estate offices in Florida and Georgia. Bill credits his Sigma Nu experience with teaching him the leadership skills necessary to lead a successful company. This prescient mindset by one of Bill’s professors would prove to be the spark that launched his career in real estate. Now, over 50 years later, Bill’s personal portfolio of individually-owned and Watson Realty Corp. properties includes 240 single-family homes, 68 office buildings or commercial properties, three apartment buildings and other miscellaneous properties. The company he founded, Watson Realty Corp., operates 43 real estate offices, 29 property management offices, two title companies, a mortgage company, and a maintenance division which includes plumbing, electrical, heating and air and home improvement, as well as a School of Real Estate, a Commercial Division, and a limited-function referral division with over 600 members. Bill remembers a culture in the chapter that expected brothers to perform well academically. “There was a degree of responsibility for those around you. We were all expected to look out for our Sigma Nu brothers,” he remembers. There’s one example in particular Bill recalls that illustrates the chapter’s support for strong academics. He was taking Saturday classes at the time and the Sigma Nus were planning their big hay ride event. Bill was dating his future wife at the time and told her he’d have to skip the event to prepare for his test the next day – a discipline not found in typical college students. 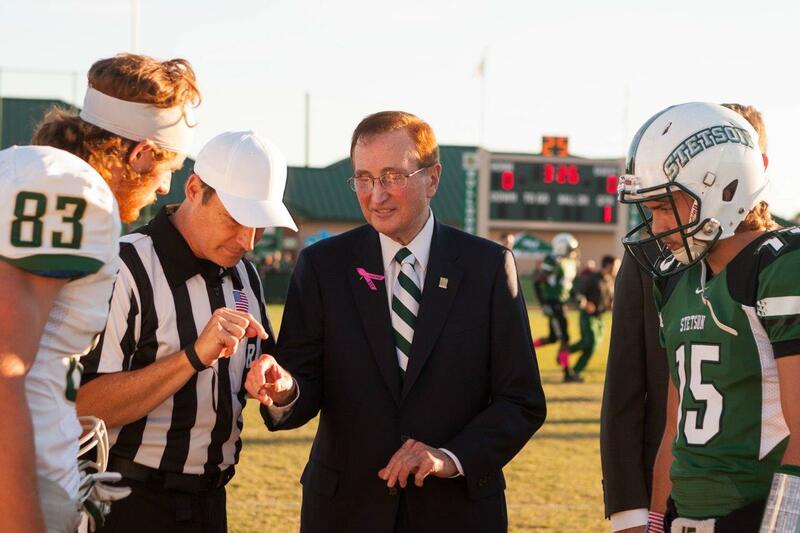 Bill prepares to toss the coin at a Stetson vs. Jacksonville football game. When Bill was attending Stetson, the students were expected to attend chapel once a week on Tuesday or Wednesday. 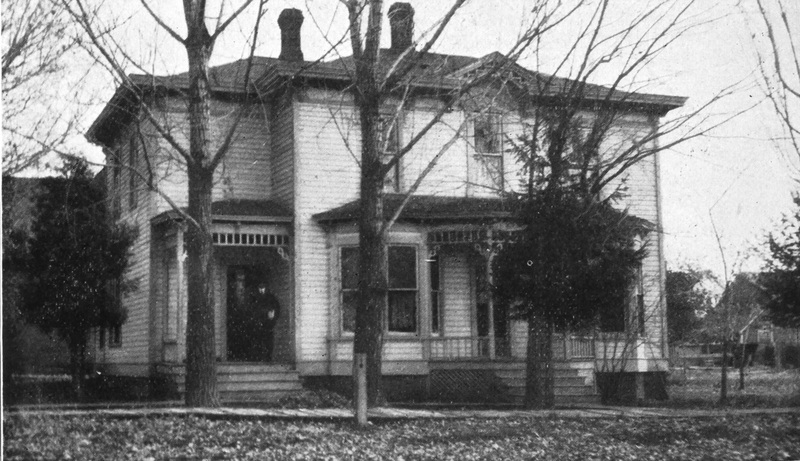 The old Sigma Nu house was two blocks from the chapel in Elizabeth Hall. 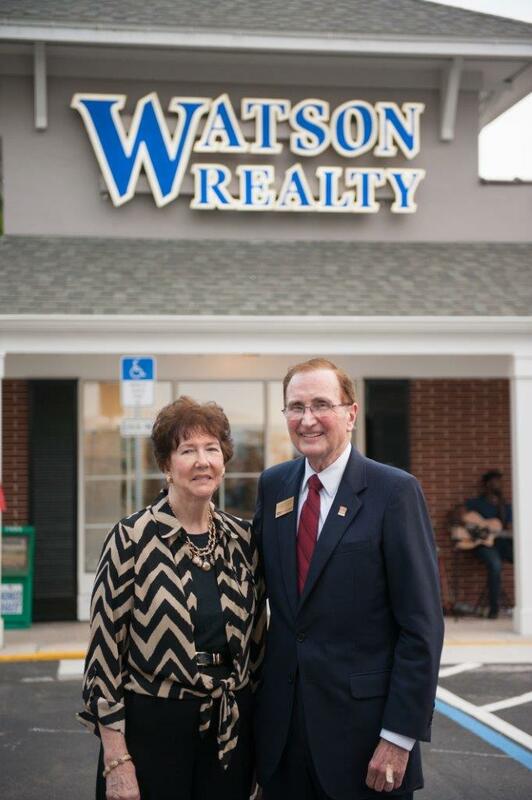 Bill Watson with his wife, Janelle, at the opening of Watson Realty Corp.’s new office in Mount Dora, Fla. When Bill was matriculating at Stetson the Delta Mu Chapter was an example of the way success breeds success. “Quality brothers bring more quality. We have adopted this same mindset with our business. If you don’t recruit quality Sigma Nus, you lose that benefit. That works the same way in business. You’re known for the company you keep.” Bill also remembers being impressed by the military inspired organizational structure and what he calls the aura of the Commander. “That’s different from a president. The commander is the leader. I liked the concept for the military connection. I liked the formality and the three cardinal principles,” he recalls. “I was impressed with the goal-setting and the emphasis on working as a team. It showed in the presence our brothers had within ROTC. We graduated a lot of great officers.” Many of these ROTC leaders Bill references would go on to serve distinguished military careers, including two Lt. Generals, Jim Crysel and Jack Woodall, who were featured speakers at the 2013 College of Chapters. “The Greeks are the ones who contribute to the university,” he observed. “Non-Greeks don’t have the same affinity for the college.” For Bill, this isn’t just an empty statement – he’s demonstrated a lifelong commitment to Stetson and the Delta Mu Chapter.